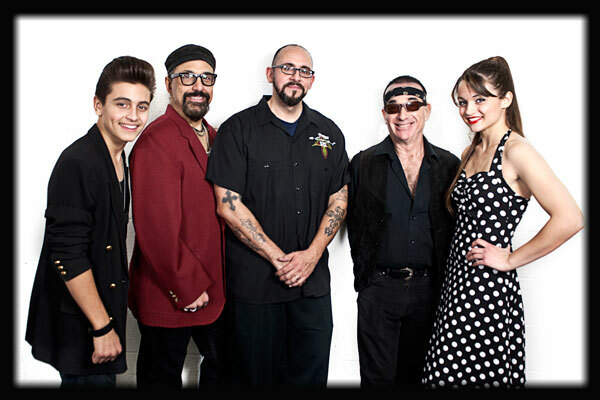 Hot Rod DeVille is a Las Vegas based cover band that specializes in Rockabilly/50’s, 60’s & 70’s music. Formed in March of 2012, as a quartet, this now 5 member band has taken Vegas and its surrounding cities by storm! The original idea was to focus solely on Rockabilly/1950’s music since no other bands were doing so. Co-founders Joey Fulco & Teo Ramirez decided to have the band branch out into the 60’s & 70’s (& more), specifically to enhance their show. Hot Rod DeVille has performed throughout Las Vegas, Beatty & Mesquite for casinos, bars, private events, special events & weddings. 2012 was a really good year for HRD as they performed in & won 2 separate Battle of the Band competitions at Whiskey Dicks Saloon & Club Fortune Casino. Wanna Book Hot Rod Deville? You can book Hot Rod Deville for your next event just by clicking the "Book Them Now" button to the right and filling out the form. We will be in contact with you about their availability as soon as possible.